Located a few meters from the sea, this villa is ideal for 4 people to spend quality time with family or friends. Thanks its quiet location and its closed garden of 318 m2 will allow you to eat on the terrace and relax outside. However, the machine is not provided, but you can book with our agency. KITCHEN: The kitchen is fitted 6. 33 m2 and fully equipped. Open to the living room, it has a fridge freezer, oven, toaster, microwave, coffee maker, pressure cooker, stove (gas), extractor hood, dishwasher, washing machine, blender, cupboards. SALON: (18. 60 m2) This room is attached to the dining room; It includes a sofa with coffee table, a TV and a TV stand for the bear, lamps, desk, storage. The DINING ROOM is composed of a large table (meal) with 5 chairs, wardrobe, furniture and doors. BEDROOM 1: This room of 31 m2 8. includes 1 bed 140 cm, table and lamp, wall cabinet, tables. outside access. BEDROOM 2: (32 m2 8.) This room is equipped with 2 90 cm beds, bedside table and lamp and a wall cabinet. BATHROOM: The bathroom measurement 3. 53 m2. It consists of a shower, washbasin with mirror and storage. CLEARING: This release 2. 36 m2 serving 2 bedrooms and the bathroom, you will find a wall cabinet. WC (1.21 m2) WC independent. TERRACE: This small covered terrace measuring 19 m2 7.. A garden with 4 chairs is available for outside dining by staying out of the wind or rain. GARDEN: Large enclosed garden of 318m where you can relax. OTHER: you have at your disposal a barbecue, a parasol and sun loungers. Possibility to rent all kinds of bikes at reduced prices thanks to our partnership with CYCLO-SURF agencies. The linen is not supplied, you can book through our agency. You can also subscribe to a cleaning option and book linen or childcare articles. 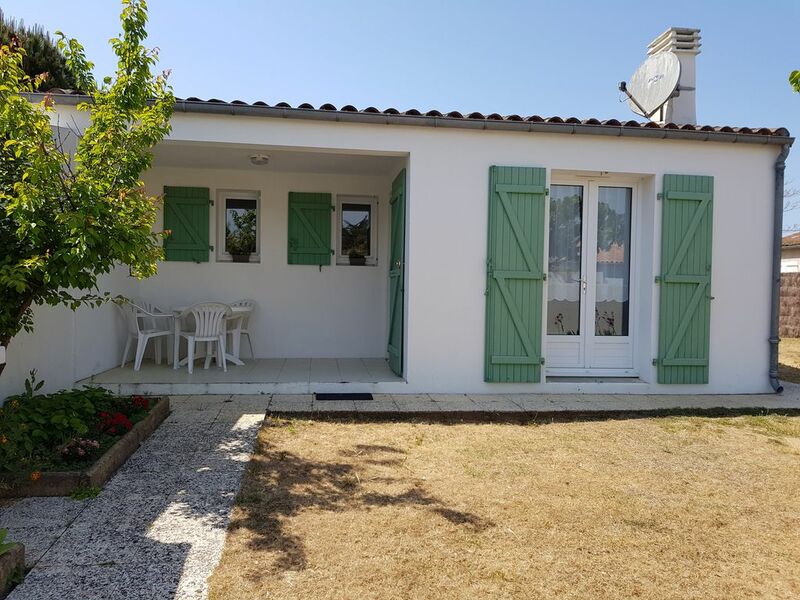 Located in a quiet area (Les Grenettes) this house is close to the beach (200m) and approximately 1850m from the center of the Noue (shops).